Outback Contractors, Inc. is a certified woman owned business and a proud supporter of supplier diversity. Outback strongly believes that everyone should have the opportunity to experience success and achieve his or her dreams. As a result, Outback is committed to developing mutually beneficial relationships with all of our suppliers and whenever possible seeks the services of diverse businesses. This commitment to supplier diversity creates a competitive and inclusive environment that mutually benefits our clients, our customers, and in turn our industry. Outback's dedication to supplier diversity is lived out daily. It can be seen in our mentorship program where we formed a successful joint venture with an 8A /minority-woman owned business. Here, we coach, mentor and develop this diverse firm toward prosperity in our industry. 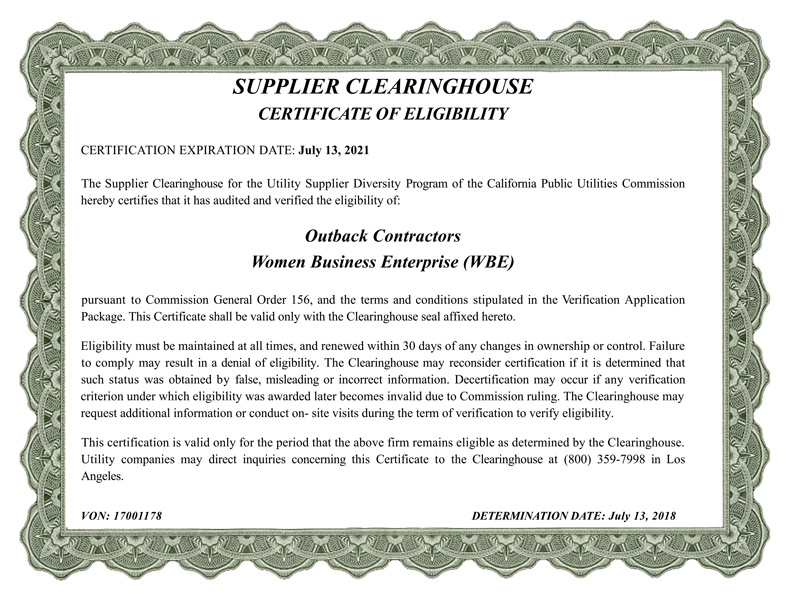 The California Public Utilities Commission oversees the Supplier Clearinghouse of verified minority firms that qualify under the Supplier Diversity program. The clearing house publishes a directory of women, minority, disabled veterans and LGBT owned companies that are qualified to participate in utility construction projects.